The NewsLine: Facebook to charge $1 from users message. The fee will mean messages go straight to a recipient's inbox rather than the Other folder which contains all unsolicited correspondence. The trial is only for a "small number of people" and is initially being tested just in the US. Users will be able to receive a maximum of one paid-for message per week, and no more than three each month. "For example, if you want to send a message to someone you heard speak at an event but are not friends with, or if you want to message someone about a job opportunity, you can use this feature to reach their inbox." The system is similar to one adopted by professional social networking service LinkedIn. Its InMail feature allows users to get in touch with people they are not connected to for a set monthly fee. 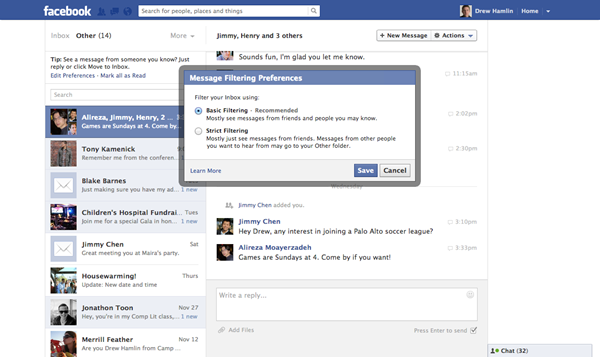 On Facebook, users can already send messages to anyone else on the network. However, depending on a user's privacy settings, messages from users who are not friends mostly end up in the Other folder. This folder, which is separate from the user's main inbox, often goes unchecked. The $1 charge will mean messages will go straight to a user's inbox. Facebook said the level of cost is likely to prevent spam or irrelevant messages. There are no immediate plans to launch the trial for users in Europe, but it could happen in the future, Facebook said. The changes are the latest evolution of Facebook's messaging service - an area of its site it is looking to expand. The site's founder Mark Zuckerberg has previously said he wants people to use Facebook messages instead of email - and the network rolled out @facebook.com email addresses to all users in June.